Is there anything the egg can't do? It makes your cakes tall and fluffy, it makes your custards custardy, and it makes this tomato sauce into dinner. We didn't actually send eggs to the underworld for our meal, we just cooked them in spicy tomato sauce. This dish has roots in the cucina povera tradition of southern Italy, but to me, it's not poor peoples' food, it's just good. 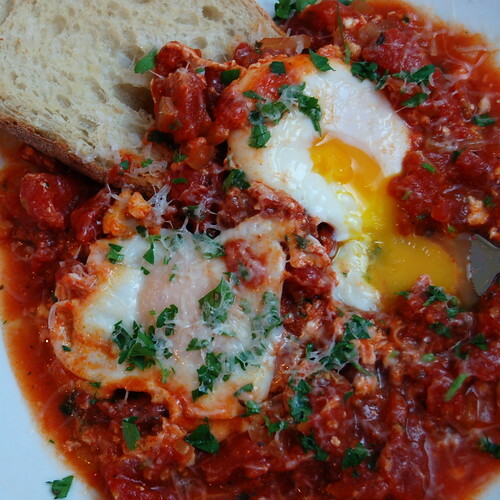 There are few things I like more than a runny yolked egg, and when you cut into this one the yolk runs out to enrich the bright, acidic tomato sauce with just enough unctuousness. You could serve it over potatoes, pasta, rice, or polenta if you like, but for a light dinner a piece of toast that you've rubbed with the cut side of a clove of garlic does the trick. Adam and I like spicy food. Add that to the fact that we're both getting over colds, and you begin to understand why I use a full 1/2 teaspoon of sinus-clearing red pepper flakes plus hot sauce. Only you know how hot is too hot for you, so use 1/4 teaspoon red pepper flakes to start and bump it up from there. It's much easier than drinking a gallon of milk with dinner. Heat the olive oil in a large wide saucepan (one with a lid, you'll want that later) over medium heat and add the onion. Saute for about five minutes until onion is softening, then add the garlic. Lower the heat to medium low if necessary to keep the garlic from burning. Saute until onion is translucent, another minute or two and garlic is just starting to get fragrant. Add the tomato paste and red pepper flakes, stir, and saute another 30 seconds, then add the diced tomatoes. Break up the whole tomatoes with your hands and add those, then add the juice from the can. Stir in the dried marjoram or oregano, and let the whole thing simmer uncovered over medium low heat for 20-30 minutes until slightly reduced and thickened. Stir occasionally. At this point, I set aside 2 cups of the sauce to use on pizza later in the week. If you leave it all in the pan, you will have a lot of sauce. Consider yourself warned. Crack four eggs into the sauce, nestling each one in a bit if you can. Cover the pan and allow the eggs to poach, adjusting the heat if necessary. My eggs took about 9 minutes to set with a runny yolk over medium low heat (the edges of the sauce were bubbling). Adam left his in for about 12 minutes and his eggs were cooked through with very little ooze left in the yolk. Serve eggs with sauce along side crusty garlic toast. Do you keep fresh breadcrumbs in your freezer? I do. When I know we won't finish a loaf of bread before it goes stale or if all that's left is the last two inches of a baguette, I rip it into crumbs and stash it in a freezer bag. You can also use a food processor, whizzing chunks of stale bread to create fine crumbs, but I like the larger pieces that come from doing it by hand, and it's sort of meditative to sit at the table with a piece of bread tearing it into eensy weensy pieces. I'm almost embarrassed to blog this because it is so simple, but the crumbs you see on top of that fish absolutely transformed our dinner. I could have just cooked the sage in a little oil and used fried sage on top of the fish, and I'm sure it would have been delightful. Instead, inspired by this recipe in the January issue of Bon Appetit, I sauteed fresh bread crumbs with the sage and made sage crumbs, also known as the worlds tiniest croutons. Oh, and we had some leftover that I used at breakfast the next morning: leftover spinach and beans and a fried egg, topped with the crumbs. Do this. You can thank me later. The side dishes were pretty straightforward, too. The sweet potatoes (four small ones, probably just over a pound total) were stabbed all over with a fork, cooked in the microwave on high for about 10 minutes until cooked through (flip them over once), and mashed with a tablespoon of butter, some salt and a teaspoon of the chopped fresh sage. The spinach was cooked in just a bit of olive oil over medium high heat until it started to wilt. Then I added a can of black beans, rinsed and drained, and a couple of teaspoons of adobo sauce from a can of chipotle chiles. I had less than a cup of breadcrumbs in the freezer, but you could certainly scale this up if you were serving more than two people. I used cod, because it was the only thing they had at the fish counter, but it flakes very, very easily, which I find a little frustrating for this sort of preparation. I'd recommend tilapia or haddock, something a little firmer that will hold together when flipped and removed from the pan. Toast the bread crumbs in the toaster oven or under the broiler, watching to make sure they don't burn. You may have to stir them or rotate the pan if your broiler/toaster oven doesn't heat evenly. Heat the olive oil in a large nonstick* skillet over medium high heat, then add the sage, breadcrumbs, and kosher salt, stirring to coat the crumbs in oil. Saute until golden and crunchy, then remove. Wipe skillet clean with a towel, or just make sure there are no huge crumbs left. 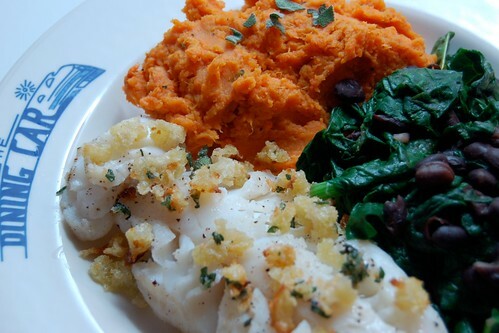 Pat the fish filets dry with a paper towel, then season with salt and pepper. Melt the butter over medium heat, and when the foam subsides, add the fish. Cook 2-3 minutes, then carefully flip the fish over and cook the other side for another 2 minutes; you may have to increase cooking time if you filets are very thick, just cook until the fish is opaque all the way through. Serve fish sprinkled with sage crumbs. *I use nonstick when cooking fish, but if you have a pan you trust not to hold your fish hostage, by all means use that. Do you ever have a thought that pops into your head and then will not go away? Like at work when you're refilling your water bottle at like 10:30 in the morning and you suddenly remember that you have a bag of french green lentils in the cupboard and you spend the rest of the day figuring out how to eat them for dinner that very night? Is that just me? Sometimes it's like a song gets stuck in my head, but instead of a song it's an idea for something to eat. So, last week I remembered these lentils. And then I remembered the little chunk of blue cheese in the fridge. And one thing led to another, and this is what we had for dinner, with a slice of crusty bread and a glass of white wine. This is one of those dishes where I'm not sure whether to call it a salad, because it's got not-quite-cooked greens or a side dish because the lentils are warm. Whatever you want to call it, it's darn tasty. First, cook the lentils: in a saucepan, cover then lentils by an inch or two with water, turn to high heat and bring to a boil, then turn the heat down to a simmer and cook until the lentils are tender but not falling apart, 15-20 minutes. Meanwhile, make the dressing: in a saute pan, heat the olive oil over medium heat and cook the shallots until translucent, 5 minutes or so. Add the vinegar and mustard and swirl to mix, add 1/4 teaspoon or so each of salt and pepper. Turn off heat. When the lentils are done, drain them and add them back to the pot, then add the dressing and the spinach, tossing to coat lentils and spinach with dressing. The heat from the lentils will wilt the spinach, yay! Taste for seasoning and add more salt and pepper if necessary. 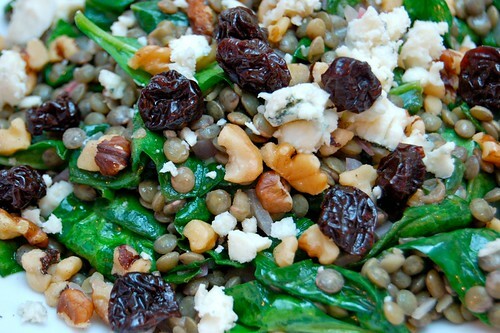 Dish out the lentils and spinach onto plates, then evenly distribute the blue cheese, cherries and chopped walnuts on top of each salad. Hi, friends. I'm having computer problems, and all my recent food photos are trapped! When I try to upload them to Flickr, my machine freezes! Eep! Which is why I haven't been here in a while. I'm working on backing everything up before I break down and get a new computer or bring the current one in for repairs, but I wanted to check in here and let you know I haven't fallen off the face of the planet. While I have your attention, can I point you in the direction of some recipes I've been intrigued by lately? I don't usually post links this directly, but hey, there's a first time for everything. Homemade pop tarts on Macheesmo. I saw this recipe in Bon Appetit, and with Nick's seal of approval I think I know what I'm doing with some of the many pints of jam I made last summer. Well, pop tarts or this delicious jam tart on Smitten Kitchen. It's from David Lebovitz's new book, which I am soooo adding to my wishlist. Lest you think I only dream of baked goods, I want to tell you I made chili from moose meat on Sunday. (My parents live in Maine, and they have generous friends who hunt.) I based it loosely on my friend Kristen's recipe, but made a smaller batch. So what's new with you guys? What recipes have you seen lately that you're just dying to try? Have you ever cooked with moose?